There must be more to this??? I met Preben many years ago, he's kosher. This has more to do with Thailand and it's direction, than him. Be warned. Thailand turning into Zimbabwe, no never. I have to just add a word of support for this guy , my ex and I was quite involved about 4 years ago buying a property from him ,when it fell apart ( not our fault ) but this guy could not have been more helpfull and communitive with us. Actually did me a favour in the long run as he has buggered off now ,, allthough I was bloody angry at the time .. They hate us and don't want us, unless they can profit out of us. 27. Brokerage or agency except in international trading. Very interesting and I was not aware foreigners could not hold jobs in certain vocations. Bloke, German I think sells sausages from a cart outside 7/11 near us. Fancy having to do that, Thais laugh and think it's some sort of novelty, none are aware it's illegal. I keep hearing references to this forum member, and sausages. Which seems to be ongoing joke between those in the know. I must confess I have no idea what is been referred to, can someone enlighten me. Possibly with a pointer to where on this forum this started from, thanks. This is the cornerstone on which Thai policy regarding foreigners is founded. Are you being serious when you say that you were unaware of this ? If so, your knowledge of Thailand is very limited. I qualified as a teacher of the English language because it was one of the few jobs that I could perform legally in Thailand. He tried to get into Gullivers soi 5 but was denied entry due to the sausages in mrs bag, no food allowed, typical Thai stupidity- but there you are. I am sure that no forum member has been selling sausages. You really must be certain that you want to delve deeper into this as it is one of the darkest secrets in the city of Krungthep. Meanwhile, steer clear of Sukhumwit Soi 11. So if one who does not need to work, like me, does not know the specific vocations a foreigner is not allowed to partake, you call that limited? 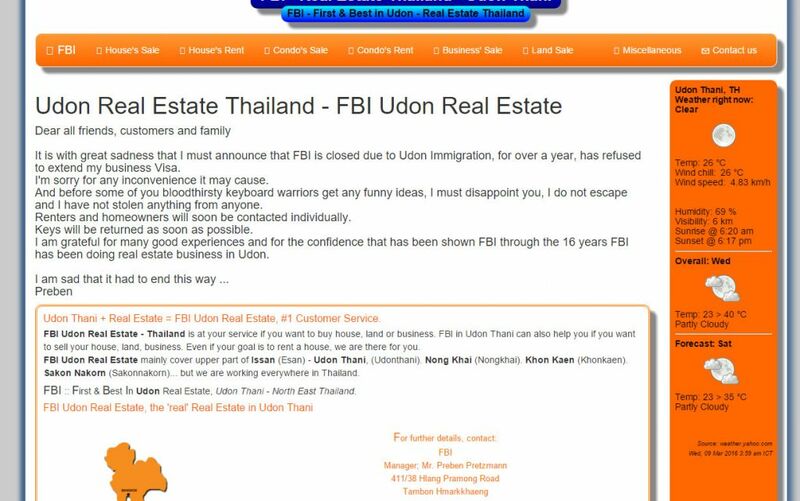 I guess for those who rely on having a job in Thailand best pay attention, or run the risk of being accused of having limited knowledge of Thailand. Sorry but I don't understand this. I wanted to go to Thailand to be with my girl friend, now my wife, and qualified as an English teacher so that I could live and work there legally. I understand that you are a pharmacist. You would only be allowed to work iin Thailand in your profession if your status was that of a key worker in a company. You could not just work as a pharmacist on your own. After 16 years... the guy must be gutted. This sort of happenibg is one of the largest reservations against building a life in LOS while depending on generating income there. All the best to him, hope he'll find another way soon. None of that is of any concern to him, why should he know when he doesn't need nor want to work in LOS. I would have thought though, that as a longterm resident one has come across these limitations for foreigners through one's socialising or reading forums.